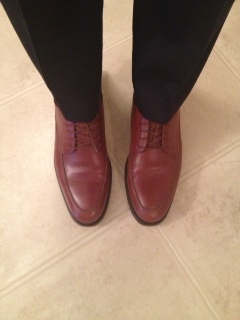 Brown dress shoes by Saks Fifth Avenue. Navy Trousers are by Perry Ellis. 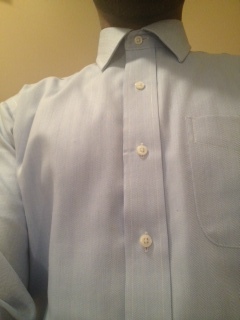 Light blue herringbone spread collar dress shirt is by Ralph Lauren. Red and blue striped silk tie is a thrifting find for 45 cents. There is no label on the tie, so I really don’t know the brand name. However, in my mind, it is a Tom Ford necktie. Now, I cannot prove that it is Tom Ford…on the flip side, you cannot prove that it is not Tom Ford. Life has its’ beautiful moments, sometimes. 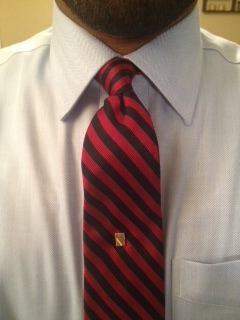 The brass tie pin is a Belk’s store brand. 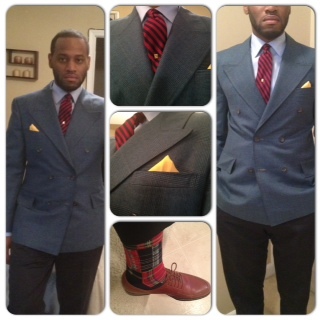 Teal plaid double-breasted, peaked lapel, center vent sports jacket is a thrifting find by Rashon Carraway and “The Carraway Concept”. I absolutely love this piece. 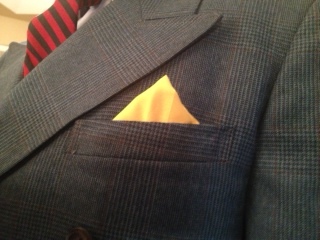 Gold silk pocket square was a thrifting find for 15 cents. This entry was posted in Uncategorized and tagged Charlotte Style, Mens fashion, mens style, Menswear, Perry Ellis, Plaid Double-breasted blazer, Ralph Lauren, Ralph Lauren socks, Saks Fifth Avenue, striped necktie, Tom Ford necktie, Wilbur Dow by wilburdow. Bookmark the permalink. Love the suit and tie.. 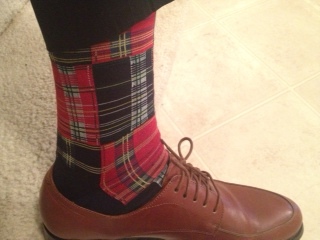 The socks give me a headache but if you like it that’s all that matters. Rock on,..